The dream of the 1890's is alive in Portland, and there is no better way to experience Portland's revival food scene than to go on a guided food tour. The guided Forktown Food Tour showcased tastings from 7 different vendors on Division Street in three hours. Many people flock to Division Street to eat at Pok Pok or Salt & Straw, but this tour instead highlighted some other trending places on the rapidly developing strip. Before getting started on our 2pm tour, my lovely friend and hand-model, Coley, picked up a Kouign Amann from Roman Candle Baking Company, an Italian bakery also on Divsion Street. Crispy, buttery, and with a thick caramel glaze, this satiated the grumbling tummy and sweet tooth at once. Now we were ready to begin our food tour! We met our guide and group at Sen Yai Noodles. The server described the food here as "college grub" because it is tasty, filling, and inexpensive. Sen Yai was created by the same owner as Pok Pok and Whiskey Soda Lounge, both of which are on Division Street. However, as the name suggests, Sen Yai Noodles specializes only in Kuaytiaw, which are the noodle dishes of Thailand. Our crispy tofu and noodle dish was paired with a cocktail made with one of their famous drinking vinegars, soda water, and gin. It was an incredible touch to start the tour! Koi Fusion brings together both Korean and Mexican flavors. Here they use fresh vegetables from the fertile Willamette Valley, house-marinaded tofu and locally-sourced corn tortillas to make their Korean tacos. We also got a side of kimchi, highlighting another food trend that Portlanders cannot get enough of. 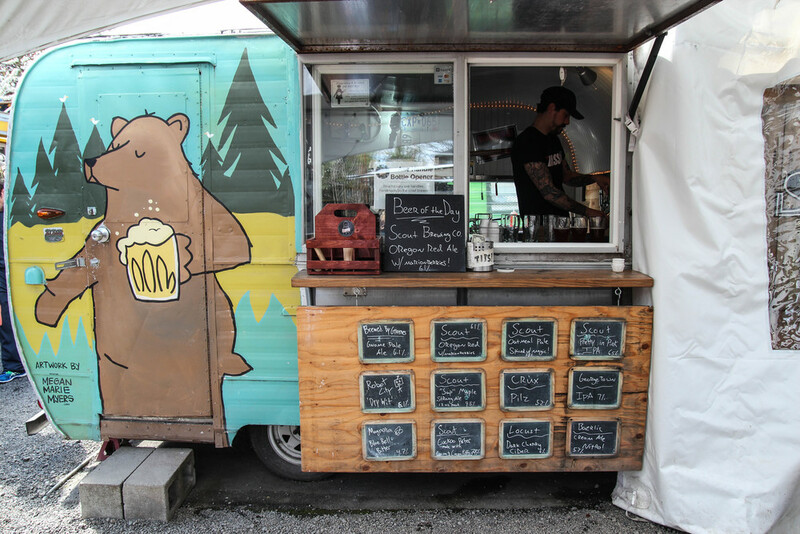 Koi Fusion got its name recognition and regulars from its modest beginnings as a food truck. With locations scattered across Portland, this location on Division Street is their newest and most "modern"-looking location. A trip to Portland would not be complete without checking out the food cart scene. These are food carts, as opposed to food trucks, because the vendors lease a space in the pod, typically for 5 years at a time. That security of having a guaranteed space allows the vendors to make a name for themselves in the food scene and to build a clientele. 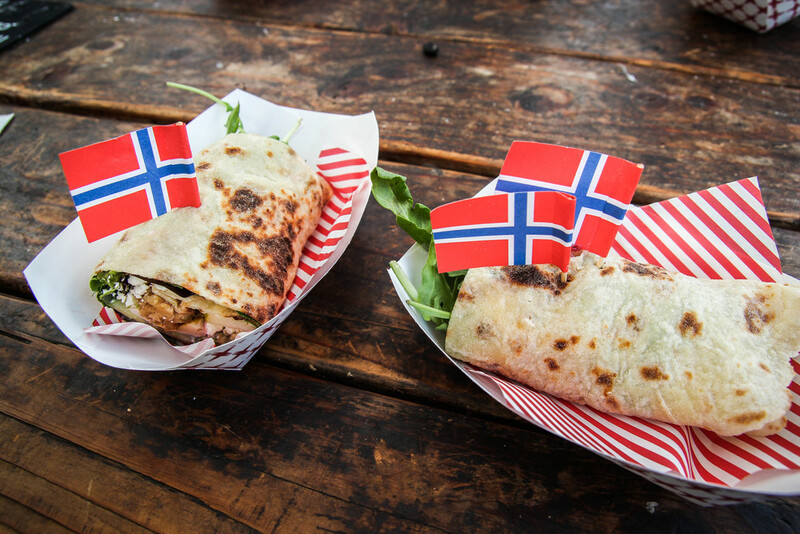 First we each tasted a lefse (potato flatbread) wrap from Ingrid's Scandinavian Food. The veggie pear lefse had fresh pear, seasonal mixed greens, a hard-boiled egg, cucumber, feta, walnuts, and a creamy cranberry sauce. Our wrap paired perfectly with the Scout Oregon Red Ale with marionberries. Sometimes fruity bears can taste flat, but this home-crafted brew had such fine bubbles that we accidentally mistook it for a nitro-brew. Sitting outside next to a fire and with live music playing beside us, it is obvious why Portlanders love these pods-especially during the warm summer months. Next we had a taste of a Portlander's take on Indian street food. Inspired by the Bollywood culture of Mumbai, the interior of this spacious eatery was decorated from ceiling to floor. In the back there is a little market where one can purchase treats imported from India. Here we each tasted the vada pav: a spicy potato dumpling dipped in chickpea batter, fried, and served on a bun with 3 different chutneys. Nicknamed "the poor man's burger of Mumbai", I relished this tasty dining stop. Our next stop, Xico, opened its doors early just for our food tour. Typically reservations are hard to come by, so this was a real treat. We started our tasting with one of the best margaritas I have ever had. Xico uses all natural citrus flavors and no artificial sweeteners or mixers, so the taste is fresh and pungent. The only ingredients in the margarita are blanco tequila, triple sec, lime, and sugar. To go with our margarita, we had an open-faced taco on a heirloom blue corn tortilla with mixed greens, pickled onions, and toasted sunflower seeds. The bright colors of the food matched the glowing inside decor. Our tour concluded at Lauretta Jean's Pie Bakery. An impressive selection of pies lined the case. 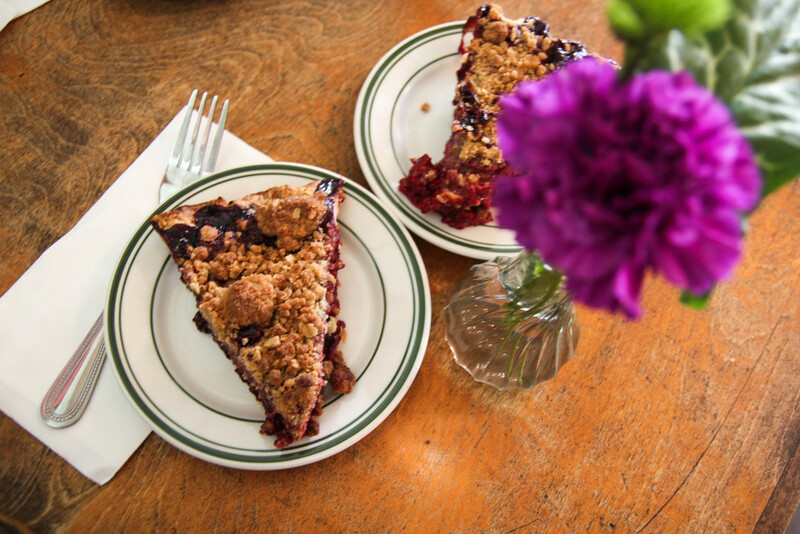 We each had a slice of the Blackberry Raspberry Streusel pie. We took our full bellies and pies to go and ate the pies for dessert later that night. After popping them in the oven for 5 minutes, we truly appreciated the buttery crust, the sweet crumbly topping, and juicy berry insides. Being a food tour guide myself, I highly vouch for this food tour! When I revisit Portland, I'll be sure to take a tour with Forktown again.